It’s 2:30pm on a weekday. You’re certain you won’t make it to 5:00pm without a snack. Don’t fall for the unfulfilling candy. Instead try Graze, boxes full of delicious better-for-you snacks, delivered to your home or office with prices that start as low as $12 a box. Right now you can snag your first box free. Graze was founded by seven friends who grew tired of the vending machine. Sourced from passionate, small suppliers, Graze’s snack boxes feature hand-picked ingredients from around the globe. Graze offers a calorie-count box (all snacks under 150 calories), a sugar-count box (all snacks under 5g of sugar), and even a protein box (all snacks over 4g of protein). Every snack is GMO-free with zero trans fats. With over 100 varieties of snacks like Zesty Chili Lime Cashews, Caramel Apple Dippers, Cocoa & Vanilla Protein Granola Flapjacks, or an afternoon miso, Graze ensures both sweet and savory snackers are satisfied. Rate your faves, and Graze will customize a snack box just for you. Perfectly portioned to curb hunger, you can choose from 8 Snack Variety boxes ($11.99), or be the office hero with the Sharing box ($25), packed with five big bags of all your favorite snacks. 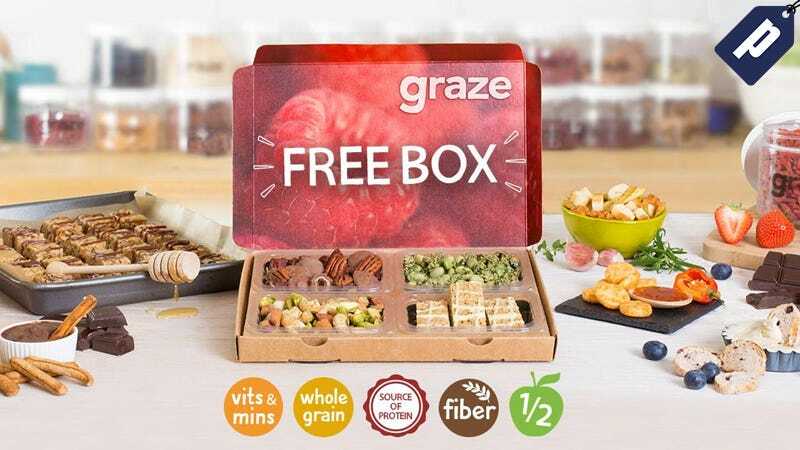 Graze is offering you the first box free, so you can start your personalized snacking today.